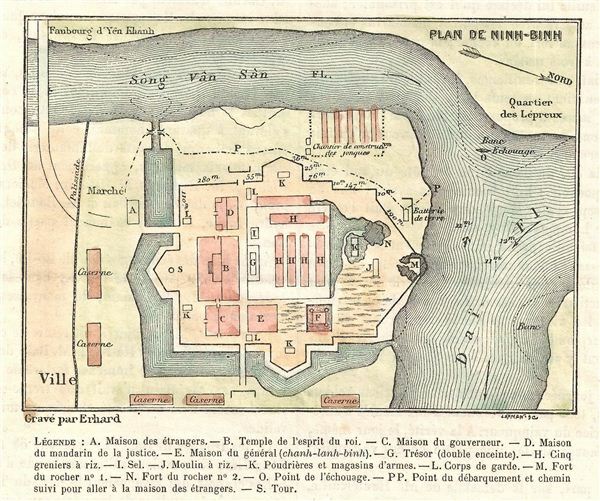 A charming hand colored, steel engraved French map of the strategically important Vietnamese citadel and town of Ninh Binh. The letters on the building indicate: A) House of Strangers, B) Temple of the Spirit of the King, C) Governor's House, D) Home of the Mandarin of Justice, e) Home of General (Binh Chanh-lanh) G) Treasure (double enclosure), H) Five rice granaries, I) salt, J) Mill, K) Powder magazines and gun shops L) guard, M) height of rock # 1, N) the height of the rock # 2, P) stranding point and path to the house of Strangers, S) turn. Why were the French mapping each building in 1877? Because the artillery mounted in Ninh Binh's lofty citadel controlled Red River traffic to the Gulf of Tonkin, and the French thought the river to be a lucrative trade route to China. In 1883 the French captured Nam Dinh, installed a garrison, and, a few months later, launched the Sino-French War, resulting in the folding Vietnam into French Indochina. engraved by erhard. Good condition. Extracted from larger page and offered matted for framing.